Select This Fireplace Summer Screen And Enjoy All Summer! A decorator’s dream! No screen mesh included. Recommended for gas burning or decorative fireplaces or for summer decoration. When it turns to that time of year when you replace your winter fireplace screen to your decorative fireplace summer screen this may be the screen for you. This beautiful fireplace screen is available in Polished Nickel (18267), Natural Iron (18268) and Black (18269). The stand with two cross bars feet provide stability. A great piece of furniture that gives you a lovely geometric display to draw attention to your fireplace opening in a very pleasing way. Even though we call this a fireplace screen, this summer screen can be used anywhere in your home or outside. A great way to decorate any area. 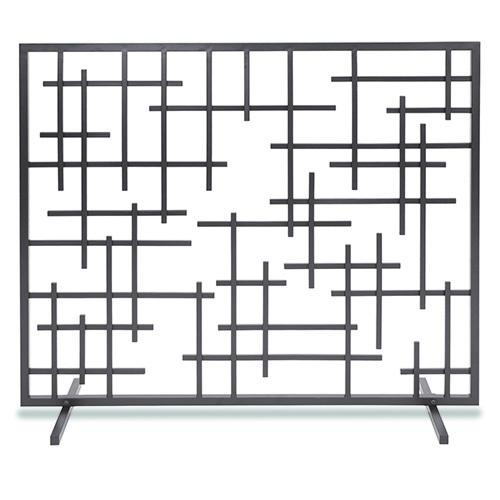 This summer fireplace screen measures 39” W X 31” H and weighs19 lbs.